On a Budget and in Peak Season! 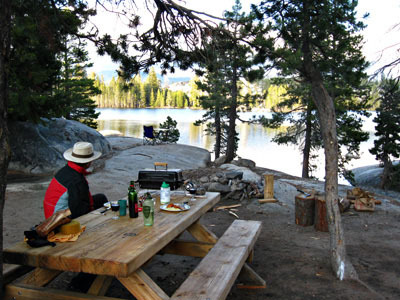 Almost everyone knows that California camping, especially in the state's most popular natural areas, the southern coast and Yosemite National Park for instance, is expensive and difficult to find - especially without a reservation. But we managed to see these areas on a budget and in peak season, too! In the mountains we found plenty of free and very scenic boondocking - often just on the outskirts of the National Parks - and we documented every site. On the California coast, unfortunately, there's not much free camping left but, although the going rate for a basic dry campsite is $40.00, we averaged $21.65 per night over our two-week coastal tour. The photos below (all taken at our own Sierra Mountain and California coast campsites) are just a few examples of what we found. 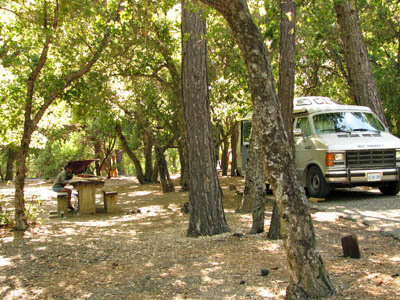 All of these campsites are accessible by regular passenger vehicles and small to mid-size RVs and, with the exception of the roadside boondocking location, they're all great for tents, too. 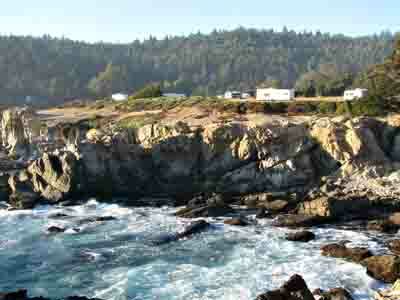 Yes, there actually is some coastal California camping (both for tents and RVs of any size) right on the beach! This coastal California camping area has a great view! 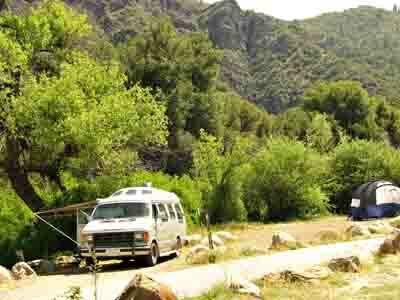 It's not free but priced far below the average state park campgrounds. 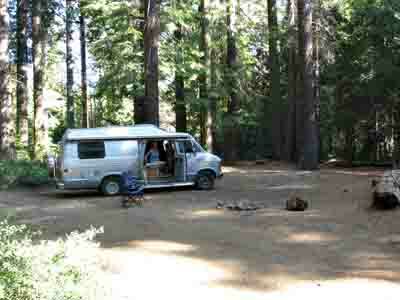 We even found free camping just outside the gates to Yosemite National Park. This spot is accessible for any-size RV! 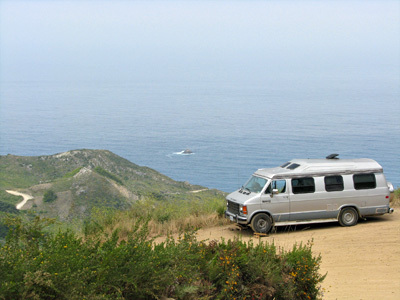 The Frugal Shunpiker's Guide, "California Boondocking: The Sierra Nevada Mountains and Coast" provides precise, easy-to-follow directions to these and more than 145 free and least expensive camping options that we've personally enjoyed along two California routes: one in the mountains, the other along the coast. "California Boondocking: The Sierra Nevada Mountains and Coast - A Frugal Shunpiker's Guide"
Draw a line on the California map from Lake Tahoe to Fort Bragg. 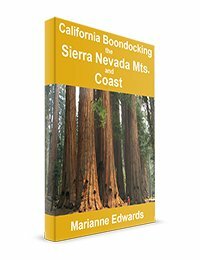 This California camping and boondocking guide concentrates on southwestern California's natural areas south of that line. It follows two routes. The mountain route takes you from Ventura (just north of Los Angeles) along the mighty Kern River Valley, to Sequoia, Kings Canyon, and Yosemite National Parks; the beautiful Sierra Nevada high country north of Yosemite; and historic Rte 49 that winds through the gold mining towns and wine country of the foothills. 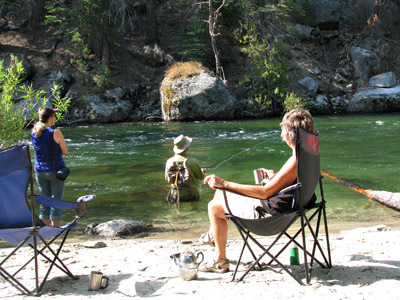 The guide lists many free camping opportunities along the way and, where free isn't available, it identifies the next-best options. The coastal route follows scenic highway 1 from Ventura to Fort Bragg. Here, free camping is difficult to come by but, while the going rate for a basic campsite at most coastal campgrounds is $40.00 per night or higher, our suggested itinerary lets you see the coast at your leisure and spend about half that amount on camping. We spent $304.00 over a two week-period. What is NOT Included in This Guide? The guide covers California's most scenic natural wonders. Although there are some camping suggestions within easy day-trip range of the biggest California cities, the guide doesn't cover attractions or camping in the cities themselves. We've visited Los Angeles and we loved San Francisco but they're now crossed off our bucket list - once was enough! San Deigo is also not covered. Except for brief touchdowns, the routes in the guide also avoid the San Joaquin and Sacarmento agricultural valleys. 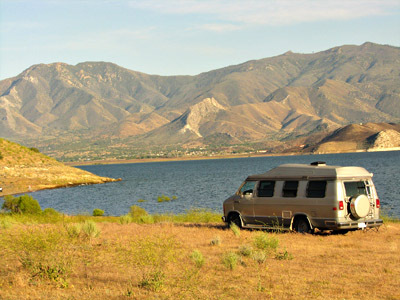 How RV-friendly is Southwestern California? For small to mid-size RVs, it's very freindly. For RVs longer than 40' - not so much. In fact, motorhomes over 40' are prohibited by law from driving on many of the highways suggested in this guide. If you are towing a vehicle, the maximum vehicle combination length allowed in California is 65'. 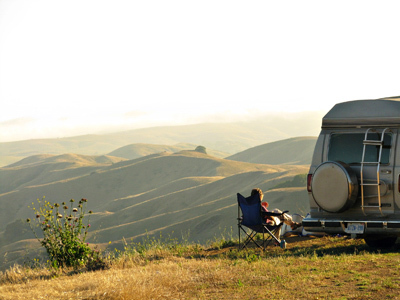 That doesn't mean that there is no useful information in this guide for those with larger RVs (in fact, there's quite a lot) but, whether you're following this guide or not, California is one place where your RV size will severely limit your options. We Were Told Not to Travel in California Without Campground Reservations. We hate traveling on a schedule and refuse to be restriced by reservations. This can be a problem in the most popular California camping areas that include Yosemite National Park and the entire coast. But we traveled here in peak summer tourist season and figured out that, where there's a will, there is also a way. The guide tells you how we found California camping when it seemed all the campgrounds were full. 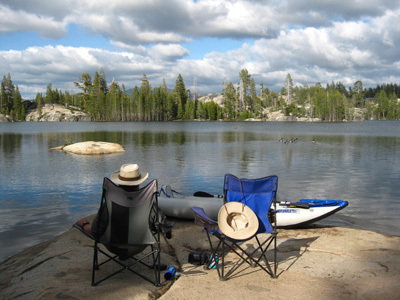 Many other guidebooks and web sites will tell you about campgrounds but not the free ones. 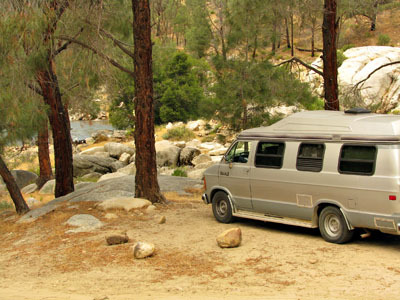 Through nineteen years of shunpiking (driving the back roads) and several California camping trips, we've discovered many scenic boondocking options where we camp for free. The guide covers areas we found that are just a little off the beaten track and often not as	crowded in peak season. If you prefer to camp for free in the most scenic locations, prefer traveling around rather than staying in one place, prefer hiking and nature to the big citeis, and are looking for affordable adventures and variety, you need this guide. It takes you on a most affordable and adventurous trip including areas of California that many typical RVers never visit. 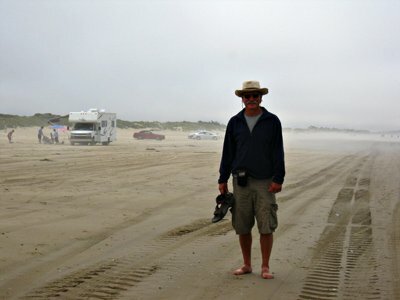 This guide is not just for RVers. All but six of the 146 suggested frugal and free California camping areas listed in this guide are suitable for tents as well as RVs. The footnotes included for each location will tell you whether a tent can be set up and also what size of RV can most easily access the sites. A route map provides a visual image of the suggested routes and areas where the guide offers least expensive or free camping. Easy Referencing: The book is divided into two color-coded sections corresponding to the two routes and the geographical areas they cover as shown on the map. A full index is also provided as an easy reference at the back of the book. A detailed 2-week itinerary for each section in the guide covers the most popular destinations on the route. Follow it to explore amazing new areas and spend less than $110.00 on camping on the two-week mountain route and less than $305.00 while you slowly work your way up the coast over a two-week period. Tips on what to see, where to camp for free or cheap, where to find free potable water, free RV dump stations, best fuel prices, showers, Wi-Fi and more. Hiking and paddling suggestions: We love to hike, so we've listed some of our favorite hikes in each region. When there's water access, we've searched out free launch locations for a kayak or canoe. Accessibility Informaiton: Footnotes show whether a tent can be set up and our opinion of what size of RV can access each of the 146 suggested camping areas. All for less than the cost of one night in an average campground. Just got back from California coast trip. Went tent camping, kayaking, and biking. Used your new California guide extensively. We found it to be invaluable especially traveling without reservations. Thanks so much!